TORONTO -- Dave Keon is finally coming 'home' to the Toronto Maple Leafs. Considered by many to be the best player in franchise history, the 66-year-old has called a truce in his bitter Harold Ballard-era feud with the club and will appear at a team-organized 40th anniversary salute to the 1967 Stanley Cup champion squad Feb. 17 before a game against the Edmonton Oilers at the Air Canada Centre. "That's great news, I hope they blow the roof off for him," former teammate Johnny Bower said last night. Keon's beef was based mainly on the way Ballard dumped him after 15 years and four Cups and a strong objection to the Leafs not retiring sweater numbers of their great players outright. 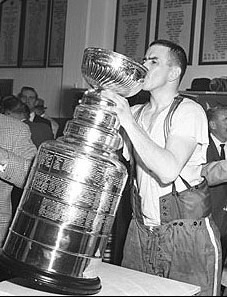 As recently as Tuesday, organizers of a March 22 reunion dinner for the '67 team had been told he was still at odds with the club, but Leafs' general manager John Ferguson played a role in convincing Keon to return. "We're thrilled he and his family will join us," Ferguson said. "I think our team could learn a lot from a Keon or George Armstrong." Fans and friends have clamoured for Keon to come back with years of letters and petitions, all to no avail. Until now. "I kept asking him, guys such as Andy Bathgate kept asking him . . . but he had differing opinions and stuck to them, so you have to admire him for that," Bower said. "But we always hoped the more pressure we put on, the more he would reconsider." Keon ranks third in career Leaf scoring with 858 points, second to Mats Sundin and Darryl Sittler. On a personal note by Bill Pauhl: As good as these two guys are they would not even be close to Keon had he remaind a Leaf! 40 years ago -- good times and good memories! Happy 67th birthday Dave on March 22nd 2007 ! !